[CIVIL WAR]. Broadside. New England Loyal Publication Society No. 200. Boston, Mass., June 27, 1864. 1 p., 9 x 10¾ in. With reports on how the Southern planter aristocracy hates Lincoln and Johnson as running mate because both rose through the ranks of the “common” people. 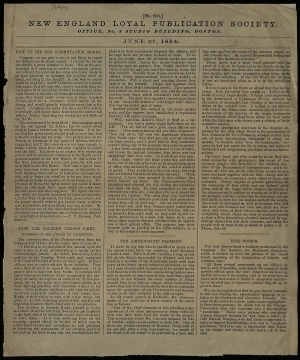 The Boston-based New England Loyal Publication Society (and the Loyal Publication Society of New York) was founded in 1863 to bolster public support by disseminating pro-Union news articles and editorials to newspapers around the country. At first, the two groups read newspapers to identify particularly useful articles and editorials and contact the editors to request that additional copies be printed. These items would then be distributed to Union soldiers or to newspapers. As the war progressed, the societies began to write and publish their own broadsides. Very good. Tape (1 inch) on verso at horizontal fold, some water stains visible mostly from back. Better than it sounds!